Posted on 09/20/2017 at 8:27 am. Germany’s premiere retro-metal rockers Kadavar have long been a favorite of mine, since their first album dropped. Their take on the heavy 70’s sound was surprisingly refreshing and convincing for a genre so hell bent on mimicking the past masters, and they had a killer fashion sense to boot. Seriously, these guys dress to impress, and they’ve got some righteous hair and beard styles to match the bombast. In a field that was rapidly becoming over-saturated, this three piece stood out as something special, and their second album still stands as a solid test to their legitimacy, not by treading any new ground, but rather by solidifying and consolidating their alchemist formula: one part Black Sabbath, one part Pentagram, and a heavy handed helping of Sir Lord Baltimore. 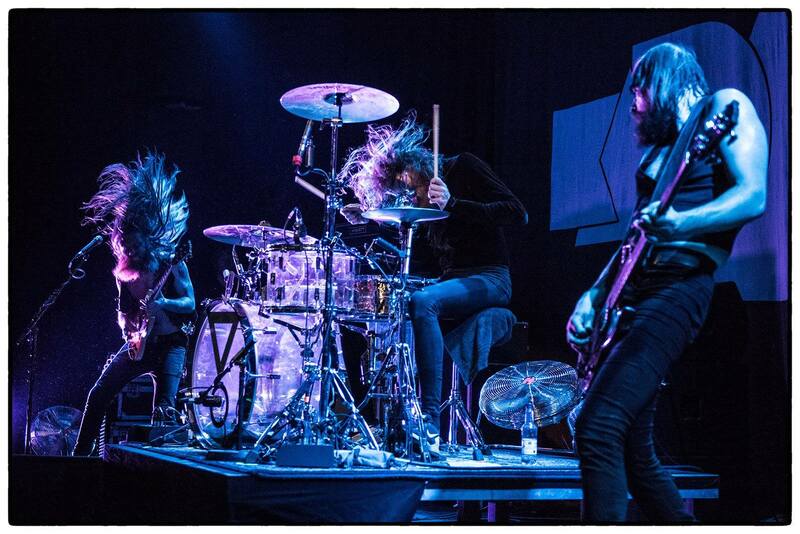 It was Kadavar’s third album, Berlin, where we saw some real growth in the band. Not only did they polish up, modernize and thicken the production a bit, they also wrote some songs that were more hook oriented and less blues based, while others took a slightly heavier approach. It’s that heavy approach that’s carried over and is thrust up front on their latest record, Rough Times, for better or for worse, for richer or for poorer…. The first three songs are really in your face, with a huge, throbbing bass tone and gnarly guitars cranking out more modern riffs. The title track leads off this album, and it starts with a bombast of hyper saturated guitars smashing through a chain of punctuated and syncopated power chords overlaid by a subtle, subdued lead. This sounds like nothing that Kadavar have ever done before, and if I hadn’t known who this was, I would have probably never guessed, even though the vocals aren’t too different from their past releases. They’ve still got that signature, shrill Ozzy-esque sneer, and “Lupus” still got a really great range. A little past halfway through the song, there’s a groovy breakdown riff that straight up sounds like something that Rage Against The Machine might have played in their heyday. The second track, “In The Wormhole” continues this approach with a more plodding but equally heavy guitar part that’s more typical of modern doom. There’s also some cool organ on this one during the vocal parts, along with a low and fuzzy guitar solo that adds some dimension. “Skeletal Blues” opens up with another big groovy riff that once again reminds me of RATM….maybe it’s the accentuated bass? Anyways, the verse and chorus are a bit bluesier; perhaps it’s the strange production choice that gives these songs their more modern edge. It’s not until the fourth song that there’s a shift in vibe and production towards what has come before. With “Die Baby Die”, that we hear anything remotely “retro” or resembling the first two albums, and even then, it’s a more busy, complicated take on that early sound. The ultra-catchy “Vampires” opens with a 60’s inspired psych sound; fuzzy chords ring out, followed by a jovial, simple bassline and some bare bones atmospheric keyboards alongside the vocals. The distortion kicks in for the second half of the verse and remains through the chorus, though it’s still one of the album’s catchier number. “Tribulation Nation” showcases both the more psychedelic side of the band that reared its head on the first two albums and the more hook oriented songwriting from Berlin, and it’s an early album favorite for me. It straight up sounds like a Hawkwind song, complete with the driving Lemmy-esque bassline, and that’s A-okay by me. The next track “Words Of Evil” sounds a bit like Sin After Sin era Judas Priest with its palm muted power chords punctuated by bluesy runs and progressive flourishes. “The Lost Child” is a more subdued song, with a sinister vibe that creeps into Doors territory with its “riders on the storm” ready keyboard parts and lush guitars, though they do rev up the old distortion pedals for the chorus. Fans of the softer, more acid-damaged Uncle Acid And The Deadbeats tunes will eat this up. 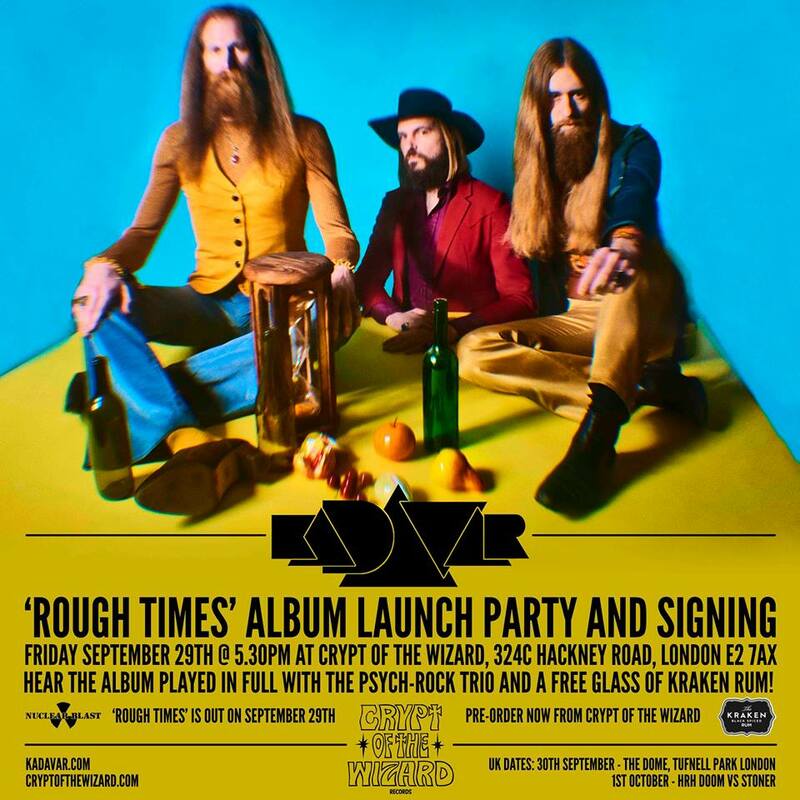 True to the album’s form, Kadavar changes gears again for the next song, “You Found The Best In Me”, a laid back, though upbeat, major key Southern rock ballad with some truly soaring vocals. They end the album with the odd “L’Ombre Du Temps”, a more ambient affair with airy whispers of French poetry spoken over the music. It’s interesting to note the contrast, how the last three songs decrease in both volume and distortion, and what a drastic difference this is from those first three songs. In a strange way, it does offer at least some semblance of symmetry and balance to the album. I don’t often do the whole track by track analysis in my reviews, as I feel like a lot of other reviewers already do that, and they do it much better than me. This time around, it feels like the obvious and intuitive way to approach Rough Times, as it’s both a diverse and an uneven record. There’s just not any other way for me to write about it that would make any sense. There’s no overarching theme or trend in the album other than its variety. I’m not sure if this album was recorded in different studios, though the drastic shifts in productions style certainly point that way. I’ll tell it straight – I don’t really care for the first three songs, and I’m not exactly sure what they were going for. I can appreciate that they tried to go there, did something different, and for me….it just doesn’t work. It’s too jarring, too clunky a shift. Are they trying to veer into the more extreme stylings of modern stoner doom bands like Electric Wizard? I’m not sure. I’m not entirely against them going for a heavier approach – they managed to do so, much more convincingly in my eyes, on Berlin. “Last Living Dinosaur” was a good, solid heavy track that didn’t sound forced. It sounded organic, natural, authentic, and these are all key ingredients of the sonic cocktail that’s made Kadavar so successful up to this point in time. Those first three tracks just don’t sound like a natural progression to me at all, it sounds phony, and the shift after these tunes towards their more natural inclinations only drives this point home. Once the tone does shift, I rather enjoy the rest of the record, and I’m well aware that there will be those who enjoy and embrace the added heft of those first three songs. Hell, I’m aware that there are also people out there who actually enjoy listening to Rage Against The Machine, as odd as that idea might be to me personally. There are probably folks who aren’t going to like some of the other tracks very much, preferences always vary from person to person. I still stand by my point that bands should experiment and vary their sound, they should take risks and try new things, regardless if these new directions align with mine or anyone else’s tastes and preferences. With that in mind, I’d highly recommend checking out this album, as it does try out a lot of different things – it seems to me that there’s at least something for everyone to like. It feels a bit like a transitional record, where Kadavar are branching out and seeing what works, and I for one am hoping that it leads to greater things down the pipeline. I’d love to see them trim the fat on the next release and really up the bar in terms of their consistency. All in all, the uneven nature of this record isn’t enough to tip the scales and dethrone Kadavar as my personal leaders of the proto-metal pack.